193 x 115 mm. – 244 leaves, with 26 large illuminated initials, 2 large historiated initials, 1 full-page miniature. This New Testament manuscript is an important witness to the evolution of the arts in 13th-century Verona, when the pictorial arts were in a state of flux. This is an entire New Testament. Until the 12th century, the Scriptures generally circulated in multiple volumes, usually in large format. In the course of the 1100s, scribes began to produce, more or less for the first time, composite volumes of all the biblical books assembled together in very small format and written in small scripts. Manuscripts containing the entire New Testament first appeared at the end of the 12th century, in the region between France and north Italy. As an entire New Testament has no obvious liturgical function, and bearing in mind the small format, it has been argued that these codices were made for lay people who were members of lay penitential confraternities. The crucifixion miniature in the present Bible sits between the Gospels and Acts, and may have had an interpretative function, possibly providing a bridge between the two texts. 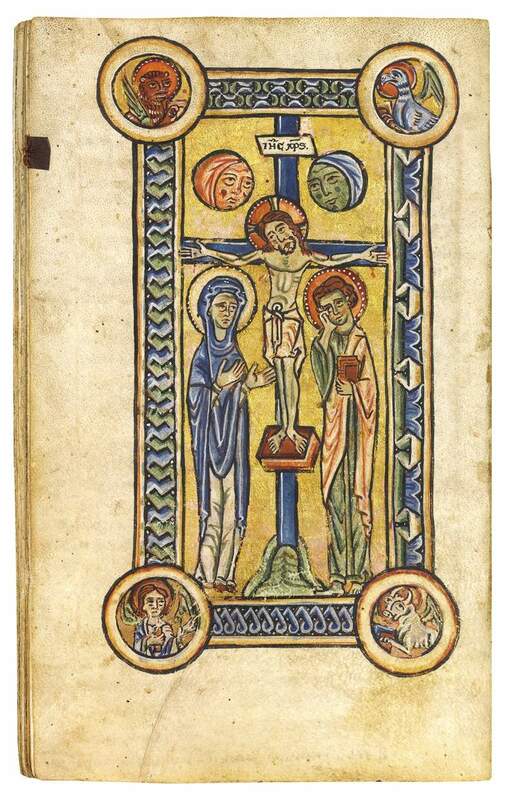 Full-page Crucifixion miniatures are exceedingly rare in Bibles. The two historiated initials may also have had a symbolic linking function. Neither marks the beginning of its section of Canonical or Pauline Epistles. The first shows St Peter, prince of the Gospel Apostles (fol. 148v), and the second shows St Paul, leader of the Early Christian evangelists (fol. 174v). These miniatures marry the two main elements of the New Testament, here in one of its earliest manifestations as a single volume.